Adopting proper descriptive terms is always a good idea if the public are to be properly informed (spades are best described as spades, after all) but it’s mighty dangerous territory for detectorists (perhaps that’s why they have restricted their proposed linguistic reforms to nighthawks alone.) After all, if we all now start calling nighthawks artefact thieves then it’s only right and proper that we call non-reporting detectorists knowledge thieves. Yes? Who could possibly deny it? People who don’t report their finds to PAS are knowledge thieves. People who don’t report find spots with maximum precision are knowledge thieves. People who still detect on land where the farmer says they mustn’t report finds are knowledge thieves. People who say I’ll just keep my own records are knowledge thieves. The unreported majority of the ten million seven hundred and forty three thousand artefacts currently showing on our Artefact Erosion Counter have been dug up by knowledge thieves. 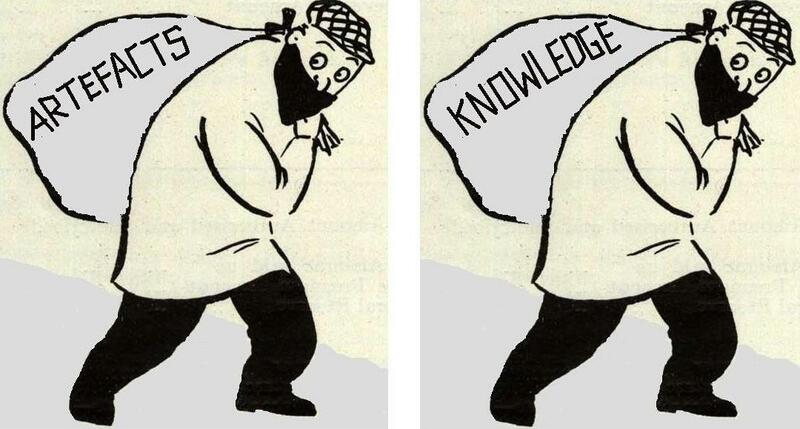 So both terms are perfectly accurate – nighthawks are artefact thieves and non-reporting detectorists are knowledge thieves. Let us all, conservation campaigners, detectorists and archaeologists, combine to deliver those twin truths to the public. Let archaeologists at last make it clear to the public that they shouldn’t allow either type of heritage thief into their fields (like we’ve been saying for years) and let metal detectorists treat both of these two sets of thieves with equal contempt and disallow them from their forums, national associations and local clubs. Let there be an end to the disreputable British pretence that stealing artefacts is dreadful but that stealing knowledge isn’t just as heritage-damaging, selfish and wrong. It is. The two types of heritage thieves. Only in Britain are the public not told they are equally contemptible. PS: if things go as they usually do, I won’t be challenged on this. Instead I’ll be blaggarded. No matter. What matters to me is that no-one, be they detectorist, apologist, archaeologist, academic or politician, will ever be able to successfully refute my assertion that non-reporting detectorists are knowledge thieves. Indeed, no-one in the latter three groups will even try, which is food for thought for all concerned – including the public, whose knowledge is being stolen with the full understanding of archaeologists! The term “site burglar” was coined by J Welsh of AAG Archaeology during the Portable Antiquities conference in Newcastle, during a discussion of an alternate term for nighthawks. some doubt as to honesty within the archeaology units , this was not persued incase it opened a can of worms! Five years in prison for retaining artefacts as if you have a right to take possession of them? We’re happy for everyone that does that to be “brought to book” as you term it.